One of the more desired of the newspapers reporting the assassination of President John F. Kennedy has always been the “Dallas Morning News“, published in the city where he was killed. Unbeknownst to most–including us for many years–is the curious obituary found on page 6 of the last section. Inconspicuously listed among the 33 entries in the “Deaths & Funerals” section is the one shown in the photo. It is a paid obituary notice inserted by a private funeral home announcing the death of an American president. The O’Neal Funeral Home handled President Kennedy’s remains in Dallas and furnished the casket in which he was sent to Washington. Although certainly not a local funeral, I suspect the funeral home sought the opportunity to gain some stature & credibility by letting all know they handled the remains of a President of the United States. Has anyone else discovered this obituary notice? 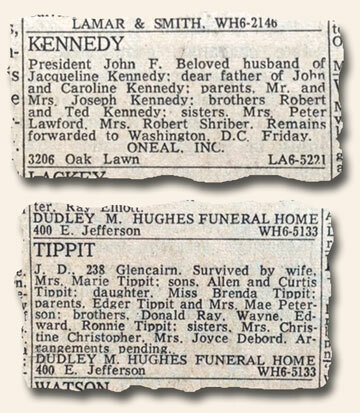 And of note as well, relating to the Kennedy assassination, is the death notice of “J.D. Tibbit”, the police officer killed by Oswald shortly after the Kennedy assassination. In fact it was for Tibbit’s death that Oswald was initially arrested, the connection to Kennedy’s assassination discovered afterwards.